A demo is the musical equivalent of the sketch a painter makes before he or she lays paint to canvas. It's meant to be fast, lightweight, and easy to pull off – a way to quickly and cheaply capture your sound and represent as well as you can to your fans, labels, distributors, or basically anyone you hope to take you seriously as a band or musician. In the past, this was easy. Just throw a few mics in your garage or practice room, run the tunes a few times, and call it a day. Nowadays, though, with recording gear getting ever better, costs getting ever more affordable, and competition getting ever steeper, this approach won't cut it anymore. To be taken seriously, a demo needs to be sharp, polished, and high quality, while still being quick and easy to pull off. The good news is that it is possible to make a high-quality demo for little money, if you know what you're doing. At Soundfly, we just launched a free online course to help you do just that. But here are some of the top things you just can't ignore if you want your demo to do what it's supposed to do and take you to the next level. Check out the course for a more complete list of gear, including types of mics. Recording a scratch track is critical to making sure you've nailed down the fundamentals of your song, including the structure, the tempo, and other details. It's also what allows all the instruments in your band to successfully follow along with the various changes. This could be a piano and vocal performance, or just a single guitar. That said, a good scratch track is all about form and not about quality, so don't worry about making the recording quality particularly good. As long as it's on the beat (why we use a click track) and captures the form of the song as you're going to record it, you're all set. After all, you'll be replacing all the parts later on with higher quality recordings. If you have an interface with only one or two inputs, you're going to have to build your track up one part at a time. Each instrument might have a slightly different approach when recording. 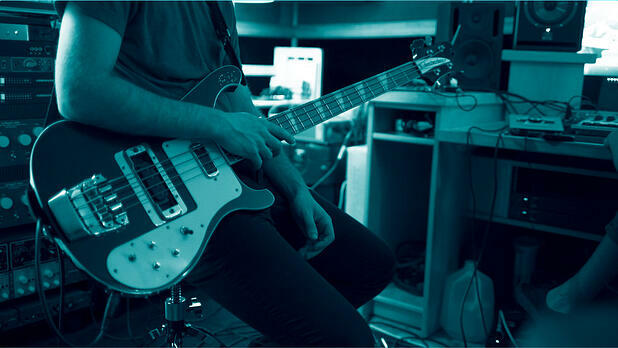 For instance, you might need to set up a mic for a guitar amp, whereas the bass can go directly into your interface. Do these separately, with your players listening to the scratch track in headphones, so that you can get crystal clear performances of each one, which you can mix together at the end. Technology has come a long way, but there are some problems that all the plugins and gear in the world can't fix. Take the time to tune your instruments, get that perfect guitar tone, and try out some different cymbals. Whether it's your drums, your guitar, your amp, or a different instrument, make sure that it sounds good before you record. Before recording a full take, check your levels by playing the loudest parts of the song first and then listening back to it. This will allow you to catch any clipping or other problems in your setup. If the loudest parts are way louder than the rest of what you're playing, you can always record those separately as well. You definitely want to run a couple takes of each track so that you have a few options. You can either start with one full take and then listen back to it making notes on what you like and what needs to change or just bang out a few in a row if you're feeling confident. Either way, having multiple takes will allow you to comp in any sections that might be a little weak later on during the mixing phase. This is one of the most frequently asked questions: Do I really need a pop filter? The answer is yes. If you don't have one, you can always grab a clothes hanger and a pair of tights and make one from scratch. If you don't use one, you run the risk of having plosives every time there's a "p" or "b" sound. MIDI is fantastic for demos because you can really tweak your take. If there are parts where you're slightly off the beat, you can quantize it – or snap it to the beat. That said, if you do this too much, it can sound a little robotic. Logic X has a "humanize" function in MIDI Transform that adds a little bit of randomness into your MIDI file so it doesn't sound too rigid. Similarly, you can drag notes around to make sure it sounds exactly as you want it. So often we assume that we can just fix anything in post-production, and a lot of things you can. That said, you will save yourself a lot of time if you just do another take or punch in a section that's a little weak rather than trying to fix it later. Obviously, there's a lot more that goes into a good demo (which is why we have a whole course on it), but hopefully these tips will give you some food for thought to get started with. Most importantly, just play around with it and see how it comes out! Soundfly is a different sort of music school for today's musicians, offering creative courses and articles for curious musicians. Sign up to check out our free courses on composition, production, business, or performance today at soundfly.com.